After a year, finishing specialization courses, in addition to some personal projects, I return in September with the blog Greed and Fear, now at www.xgreedandfear.com, always with the usual analysis, ideas, and comments from the daily newspaper of Wall Street. For a better search of the topics of the blog, my main suggestion is to use the Blog Labels, for example, Trader Notes or Stocks to Watch. On the Watchlist page, I include the current watchlists of stocks which I'm following. In this page, you also can write your opinions, suggestions, and comments. 1°. Briefly comment on the news of the company (or commodity or sector), reviewing its environment, using as a tool the fundamental and technical analysis, that the years in trading have shown me that NECESSARILY go together for be profitable. 2°. Then present (shaded in yellow) the main idea or suggestion for the case. 3°. Finally mentioned or recommend (in red) the stocks (or etf) to be followed, and, if necessary, propose your purchase, or have it under observation 'on the radar'. As a disclaimer: the recommendations of buy or sell aren't an investment advisory, there are just information for you. Greed and Fear is not responsible for the results obtained in your trades. Finally, you can meet me at Linkedin and follow on Twitter or StockTwits and comment from those pages, much more agile and immediate, requirements that every trader is looking for. I hope to have your usual follow-up and support. 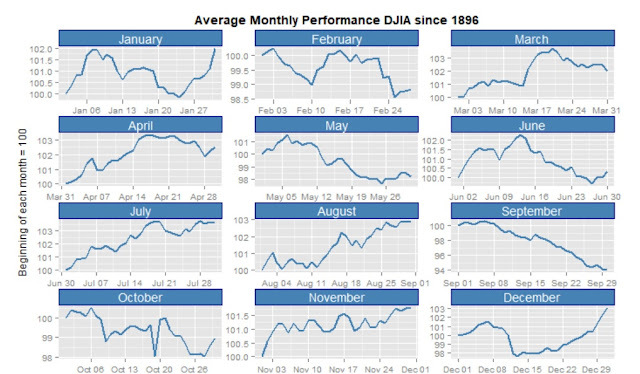 Seasonality: be careful since the end of this month, because September is usually the worst month for the Dow Jones, as December is the best.